:How does Christianity change the way we view the natural world? 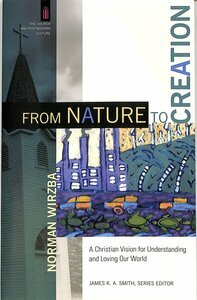 In this addition to a critically acclaimed series, renowned theologian Norman Wirzba engages philosophers, environmentalists, and cultural critics to show how the modern concept of nature has been deeply problematic. He explains that understanding the world as creation rather than as nature or the environment makes possible an imagination shaped by practices of responsibility and gratitude, which can help bring healing to our lands and communities. By learning to give thanks for creation as God's gift of life, Christians bear witness to the divine love that is reconciling all things to God. About "From Nature to Creation: A Christian Vision For Understanding and Loving Our World"